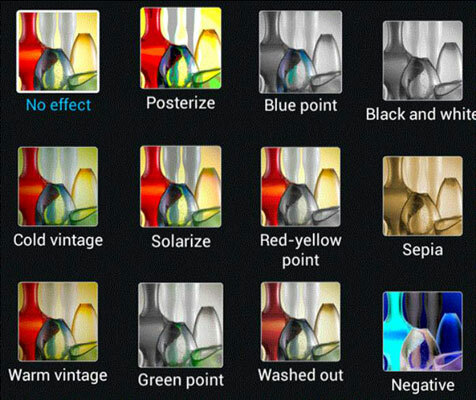 Between the White Balance and the HDR setting, your Samsung Galaxy S 5 phone works very hard to give your photos the best color possible. However, there are times you may want to have more control over the process. ISO: In the olden days of film, the International Organization for Standardization (ISO) defined a numbering system that would be used for film. Film that was “slow,” such as ASA100 film, was good for bright conditions. The fast film, such as ASA500 or ASA800 film, was good for dim conditions. This setting lets classically trained photographers control their settings using old-school terms. Center-weighted: The default for most pictures. Spot: This option focuses on the spot in the viewfinder and lets the rest of the image appear either over-exposed (in bright light) or under-exposed (in dim light). Matrix: This setting exposes the image over the entire scene. Effects: If control of the exposure in the previous two settings is not enough for you, the Effects options take things to a new level. There are several Effects available. Additional effects also can be downloaded to your phone. Exposure Value: This setting determines how much light gets to the camera sensor, allowing you to over-expose or under-expose your image for your own creative purposes. These modes help when you’re taking the shot, but you can also edit an image later. It’s easier to do complicated image editing on a desktop computer, but you can make some simple edits on your phone right away. It’s your choice.